Is it worth drawing, because everything is already created before us? Is it worth writing music, because Bach and Mozart have already written everything? Is it worth composing songs after the Beatles or Bob Dylan? Before Leonardo da Vinci, The Last Supper was painted many times. Maybe he shouldn't have taken a brush? Did it make sense to reinvent the car when everyone knew how to ride a horse? It seems to me that for the person who creates the question “to do or not to do?” is meaningless. If there is something to say, if there is an idea, there is a thought, then it is worthy of embodiment. The question is different. Will it be in demand? Will it be possible to implement it? And if you look at what Leonardo da Vinci was able to realize from his plan, then his life is more tragic than full of success. Many famous artists all their lives were in poverty and obscurity. Aren’t afraid? It would be more accurate to say that they leave without seeing wealth and recognition. van Gogh died at the age of 37, having sold, as far as I remember, only 15 of the more than 2,000 paintings he painted. Toulouse-Lautrec also died at the age of 36 and received a well-deserved recognition only after death. Georges Seurat, inventor of pointillism and a scientific approach of color in painting, died at the age of 31. If Leonardo da Vinci would have lived only 31 years, then we would not have known about any genius of Leonardo. In 30 years he was an artist without customers, and in general he considered himself as an artist at the last time. With difficulty he escaped from Florence, where he was not needed by anyone, to Milan as a musician, where, finally, he was in demand ... as an organizer of holidays. Event Manager. In Florence, Leonardo actually vegetated for 15 years. Although the status of master of painting received in 20 years. Those 10 years no one recognized him as a worthy order of the artist. Leonardo received an order for The Last Supper at 43. And as we know it was only a fresco for the wall of the monastic dining room. A “deafening” confession, isn't it? And I hasten to remind you that many artists, who are now considered brilliant, were already dead at this age. Probably it would be the easiest way to be demand. 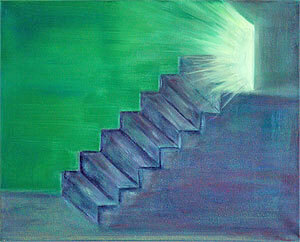 But I don’t search for easy light ways. However, as I understand it, Leonardo da Vinci did not really want to be an artist. At that time for him it was a forced choice of profession. Leonardo da Vinci is more a researcher and inventor. That was the meaning of his life. And drawing was only a hobby and sometimes a way to make money. 67 years Leonardo da Vinci managed to feel his piece of recognition. What if he died at 31 years as Seurat or at 47 as van Gogh? Futurologists claim that the first person who will live to 150 years is not only born, but also a couple of decades older than me. So I have a chance. And so do you. Louise Bourgeois made the first solo exhibition only after 70 years. And before her death at 98, the exhibitions were sometimes held 10 times a year. So the question in the modern world of art is not “when they recognize,” but “whether the artist will alive or not.” There is always a chance. Will the artist break and leave attempt to be demand? This is a much more complicated question. After all only the collapse of the USSR allowed Ilya Kabakov and Erik Bulatov to become world celebrities, and not disappear into Soviet socialist poverty or prison. It seems to me that it is wise to act like Michelangelo. He was generally indifferent to fame. He was interested only in his work. And he worked up to 88 years. 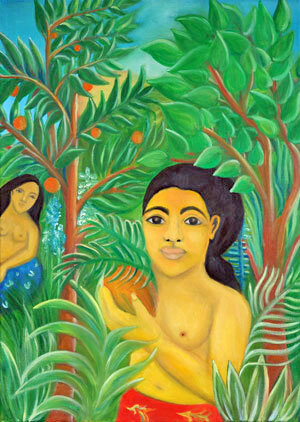 Or you can follow the example of Henri Rousseau. He did what he considered necessary and ignored any attacks and ridicule. Where are those who called him a customs officer, and did not confess him as an artist? Today Rousseau is in all major museums. I think this way is more reasonable. You need to do your own thing and keep your faith. 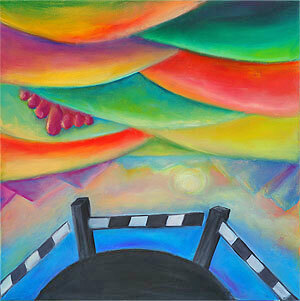 Why do you prefer canvas rather than today's multimedia art? 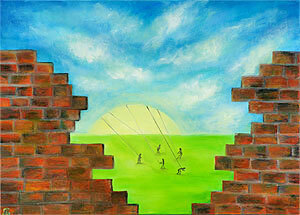 Canvas gives independence and freedom. In combination with sites and social networks you need not so many means to create and show. But besides the canvases I have scripts, novels, children's books. There are projects of interactive exhibitions and public art, sky art, media art, happening, performances, flash mobs, toys, sculptures. The point is not the fabric on the frame and the mixed with the resin pigments, but the idea and the most convenient and accurate way of saying. It can be a text, a picture, a film, and a viewer’s immersion into a certain action. It is not the material that dictates the decision, but the idea, the thought, which is looking for suitable material for the realization. Why do people need art at all? Why do you need a taxi driver? To take someone to the airport. These question is easy to answer. But the questions ‘’ Why do we need the theory of relativity, the Higgs boson, theoretical physics’’ are much more difficult to answer. And it was just as was for Hertz to answer about electricity. Hertz himself said "It's of no use whatsoever... this is just an experiment that proves Maestro Maxwell was right - we just have these mysterious electromagnetic waves that we cannot see with the naked eye. But they are there." And now we have Hertz in every electrical outlet and “we boil water on it”, as Count Cagliostro would say. And in the time of Mendel, it was completely incomprehensible why study the crossing of peas. Even the scientists themselves understood this only half a century later. And now we buy every day in the store the results of all this fundamental science in the past. And soon we will buy genetic pills that effectively and permanently cure diseases. Art is also about creating the future. Unless of course, this is a topical illustration ... although it is too. Even kitschy sugary images create the future. Or totalitarian socialist realism. The question is what kind of future does the art create? 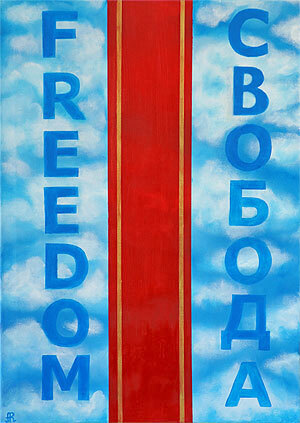 For example, what future will create a propaganda poster or totalitarian art? Hitler's Germany? What will the future look like? Like a prison or freedom? As far as I’m concerned, this question is basic for the artist. What energies does it create? Does his creativity increase the amount of good in this world? Will his creation be a tablet of happiness for other people? Do you think there are any parallels between your work and the paintings of past masters? 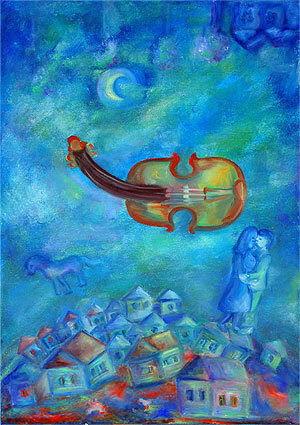 The most obvious parallel, probably, is the cycle of paintings by JazzArt. Each picture of this collection is dedicated to the work of one or more artists of the past. 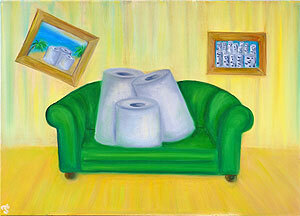 It’s like my homage, dedication, friendly grotesque to artist’s creativity, significant events of his life. For example, the Impressionists loved to work in the open air in order to capture the nuances of light. Claude Monet painted 25 paintings with stacks. It was logical to dedicate to the Impressionists a friendly grotesque. 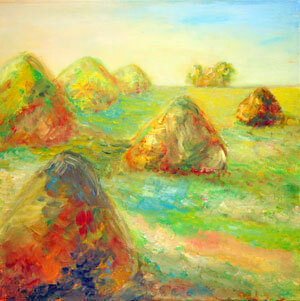 I called it Impressionists on vacation in haystacks. 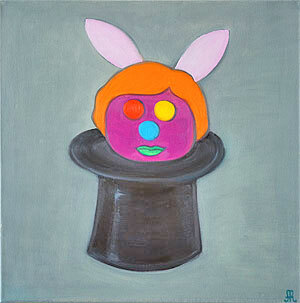 Portrait of the Hat of John Anthony Baldessari. This picture is dedicated to the artist's unrelenting imagination, his creative generosity, when styles and trends grew out of his ideas, like from magician's hat. Well, then, how else would it be possible to portray a person who painted the walls with the phrase “I will never do boring art again”? 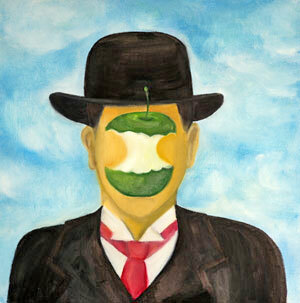 Portrait of Rene Magritte is a grotesque for his imitators, biting off little pieces of Magritte's ideas and, as a result, in his works only an apple stump from The Son of Man. 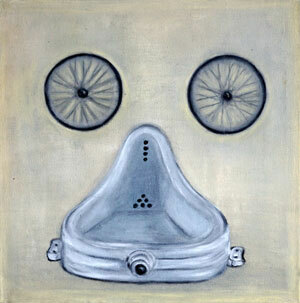 Portrait of Marcel Duchamp is the most ironic and composed of his two most famous and provocative works. This is, of course, friendly caricature. But what else could be done if you want to write a portrait of the godfather of all modern art? Of course, the improvisation on the themes of Chagall, Rousseau, and Gauguin are the paintings The Mark Chagall’s Violin and Paul Gauguin’s girls in the gardens of Henri Rousseau. Direct indication of the dedication of artist's work is the painting The Worlds by Erik Bulatov. If we talk about the pictures of the SmartArt series, then the parallels are more tangled. Michelangelo Buonarroti and Hieronymus Bosch, mocker Piero Manzoni and philosopher Joseph Beuys, Salvador Dali, Kazimir Malevich and Marcel Duchamp. 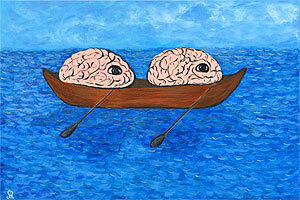 I think that their influence, or rather the echo of their breathing, can be found in the paintings “Journey of brain”, “Way”, “Move (The people)”, “Pacific (What's happening in this world?! 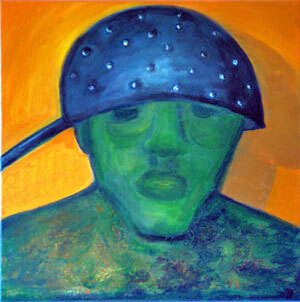 )”, “The Halo (Reach The Light)”, “Range of vision (Horizon)”, “In front of the TV (Family portrait)” and “Colander (Pan-man)”. 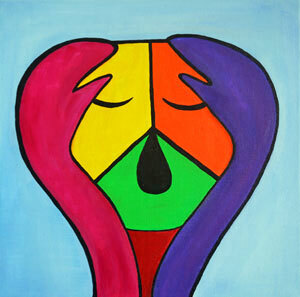 A collective dedication to artists and creators are the paintings "Ordinary - Talent - Genius" and "Optimist - Artist - Pessimist". The echo of the work of Andrei Tarkovsky is my script for the short film “Freedom”. And in response to the work of Kusama or Gutov is the concept of “Web of Light”. To be honest, I am not always clear what is coming from. And I'm not quite sure that there is any point in sorting this out. This is the eparchy of art critics. This is their bread. My task is to create.